It has bee more than a week since my last update post. But I thought Periodic Update sounded bit odd. I've still been reading and posting when I feel like it. I'm taking part in several upcoming blog tours. I've got a review coming tomorrow and Thursday. Then I've got between 1 to 3 posts per week scheduled (reviews & other blog tour stuff) until the middle of June. I've had the urge to write a few times in the last two weeks and then got sidetracked by something else. I've been a bit distracted by Minecraft. Two weekends ago my son and I played for way too many hours. We're also in the middle of spring sports. My husband is coaching my son in trap shooting and baseball. I'm doing the scorekeeping for the trap shooting. So that has kept us busy several days a week. Now the end of school year activities are upon us - band concert & awards program. My daughter is set to come home for the summer next weekend. I can't wait to get her back home. We'll be heading to Orlando for a family vacation in July. We're skipping Disney this year. We will be staying on Disney property. I think we'll probably end up at Universal for a couple of days. I want to get at least one beach day in. I'd really like to find a beach restaurant to eat at. Then I'm still looking for other things to do that we haven't done before. We've been several times and I'm trying to find new things to do that we were always to busy with Disney and/or Universal to be bothered with before. You may have noticed that I stopped putting a rating on my reviews. It's something I've been thinking about for a while now. My ratings don't have much meaning to them. They are just an arbitrary number that I give the books. Instead I've decided to be sure to include what I liked about the book and what I didn't like. I felt like this was more important than a rating with no real meaning. 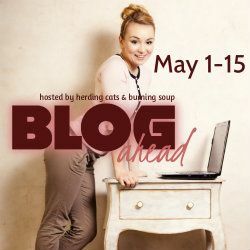 Lastly, I've decided to take part in the Blog Ahead Mini event being hosted by The Herd Presents and running May 1 - 15. It's meant to get us to schedule more posts. I can always use help with doing this and it seems to help me to focus on my blog when I take part in an event like this. At this point I really don't have any goals. We'll just see what plays out. If you'd like to check it out as well, just click here. I can definitely relate with you on this being a busy time of year, Carey. I have band/orch competitions and awards, etc., coming up as well as graduation. Funny - we'll be on the east coast in July as well...in Georgia. Cool that we'll be on the same coast! Did you join the Blog Ahead Facebook group? She posted a blog post with a list of daily memes/post ideas. There were a few I hadn't heard of before and thought were definite possibilities.